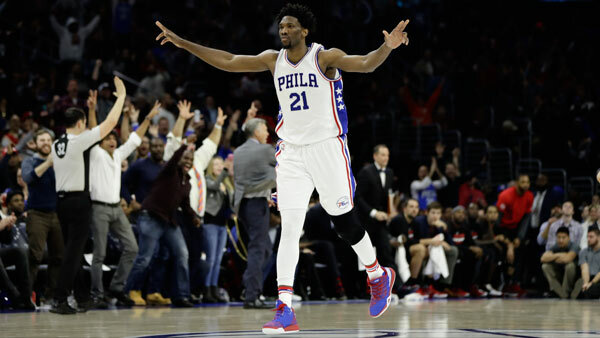 PHILADELPHIA -- Philadelphia 76ers center Joel Embiid has not been cleared for 5-on-5 drills and the team will take a cautious approach in his return from his injured left knee. Embiid's career has been riddled with injuries and he missed his first two NBA seasons. Embiid played only 31 games last season and had surgery in March to repair a torn meniscus in his knee. Team president Bryan Colangelo and coach Brett Brown said Wednesday the team will soon decide how to handle his playing time when training camp opens next week. There probably were few, if any, fans at the Home Run Derby taller than Joel Embiid. Colangelo said he was optimistic the Sixers and Embiid could agree to a contract extension before the Oct. 16 deadline. Colangelo said there were some unspecified criteria Embiid needed to hit before he was cleared for 5-on-5 drills. He averaged 20.2 points and 7.8 rebounds last season. Joel Embiid is teaching the process to some young basketball players.